750,000 trailers and counting as iconic firm celebrates diamond anniversary | News by Wales Express News, People Before Profit! Exports are booming as Europe’s biggest trailer maker celebrates two important milestones – its 60th anniversary and the 750,000th trailer rolling off the production line. Overseas sales now account for more than 30 per cent of the business at Ifor Williams Trailers which has a worldwide network of distributors. The firm also has manufacturing sites in Corwen, Ruthin and on Deeside Industrial Estate. Last year it opened a new £5 million production facility in Sandycroft, in Flintshire, to create extra capacity to cope with the bulging order book. The company employs more than 500 people across all the sites. As well as having a network of 50 UK trailer outlets, the company has Distributors as far afield as Australia and New Zealand – and sells its trailers as far afield as Russia, the former Soviet republic of Georgia, the West Indies, Japan and Africa. 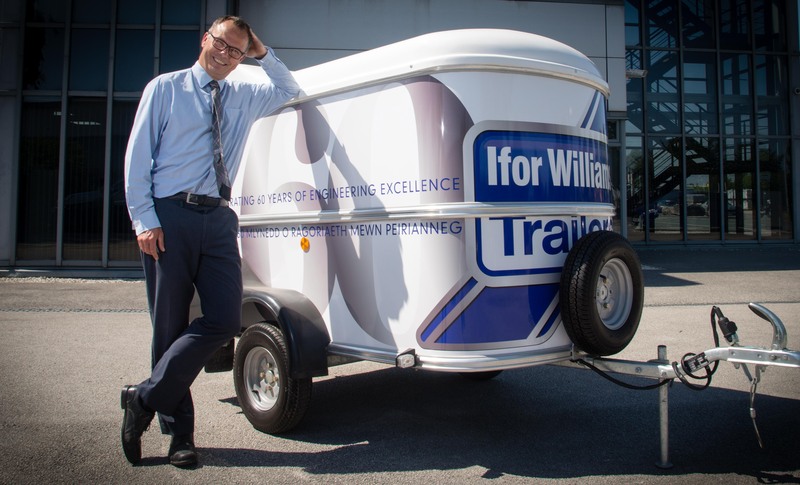 Ifor Williams Trailers is the leading manufacturer of braked trailers in Europe with Scandinavian countries like Norway and Denmark being growth areas. According to Business Development Manager Peter Nesbitt, sales are also taking off in Australia where the firm now has three distributors with more in the offing. Mr Nesbitt said: “It’s great in our 60th year to be in such excellent health and for our prospects to be so positive. “The sales have been very strong and consequently we’ve a very considerable order book and it’s allowing us to move forward and invest in new manufacturing facilities like Sandycroft. “That’s a real indication of our confidence in the future and the fact that were planning for an expecting continued sales growth both domestically and with our exports. “What we’re seeing is good growth of exports in a broad range of products throughout our existing export markets in mainland Europe. We’re also seeing accelerating export sales further afield in places such as Australia. “We have three Australian distributors at the moment in New South Wales, north of Sydney, in south Australia close to Adelaide, and in Perth in western Australia. It was also particularly gratifying, said Mr Nesbitt, that the trailers were so highly-regarded in Germany where a few years ago their horsebox was judged to be the best in Europe. It came out on top in a tough series of tests as part of a survey conducted by Cavallo, the leading German horse magazine. It was a sentiment echoed by Managing Director John Williams who was proud to reach the company’s Diamond Jubilee year in such good shape. He said: “We are extremely grateful to our loyal customers who have supported us over the years. Without them the company would not be where it is today. “Our philosophy is to produce high quality trailers that combine high technology with strength, durability, ease of maintenance and value for money. “We are an independent company with one focus: to build the best products on the market. “Thousands of people choose Ifor Williams Trailers each year but in an increasingly competitive market we are not standing still.